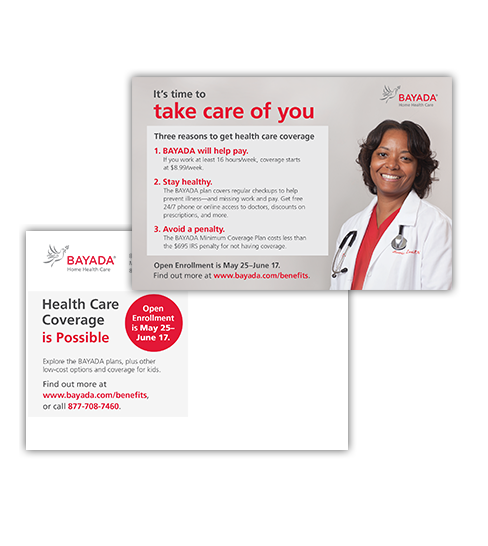 In the face of climbing ACA penalties, a multi-channel approach and targeted communications spur record enrollment in BAYADA’s low-cost health plan. BAYADA is one of the country’s largest providers of home health care, providing nursing, rehabilitative, therapeutic, hospice, and assistive care services to children, adults, and seniors in the comfort of their homes. The company deploys more than 24,000 field employees from 335 field offices across 22 states. This company really cares about its employees, who are dedicated to the mission of providing quality at-home health care. They are also primarily low-wage earners. And although BAYADA offered a low-cost health plan—specifically designed so that low-wage earners could meet the ACA individual mandate requirement—enrollment in it was sparse. So, in the fall of 2015—with ACA penalties climbing—BAYADA hired Benz to make sure its employees knew about and enrolled in a medical plan to avoid the ACA individual mandate penalty. Our first task was to help BAYADA prioritize where to focus limited resources to have the biggest impact. We conducted in-person interviews with field employees to learn what was most important to them and to identify the barriers preventing them from enrolling in coverage. 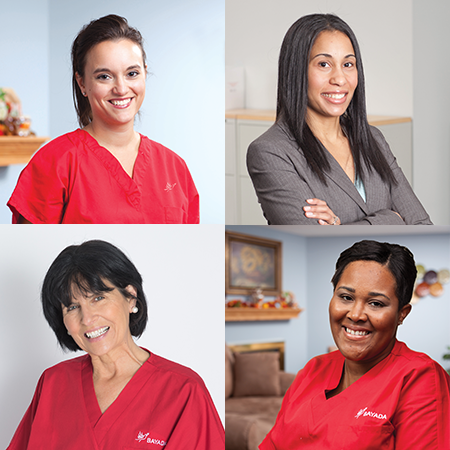 These first-hand accounts were key to developing the right channels and messaging for BAYADA’s different employee populations, such as home health aides, nurses, and office staff. To improve accessibility, we introduced a new tone and voice that put the employee at the center of messaging and simplified complicated insurance jargon. It included straight talk about health care costs and explained cost sharing and steps BAYADA takes to keep health care affordable. 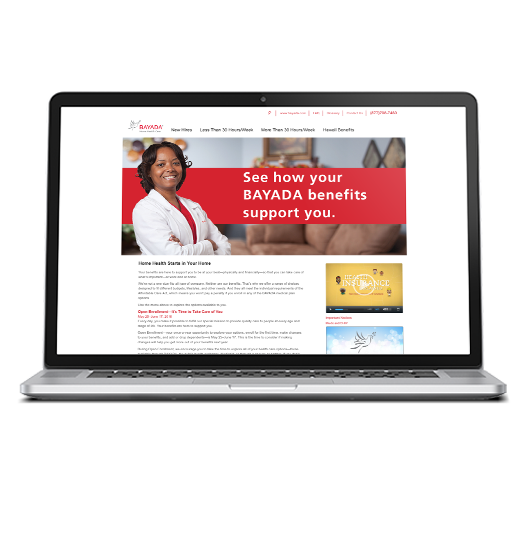 BAYADA’s existing benefits website, which was more of a repository of information than a useful communication channel, was at the forefront of this effort. We rearranged and rewrote existing content so that employees could find what they needed and feel supported. We also created a new section just for new hire benefits onboarding. To reach BAYADA’s diverse—and dispersed—workforce, we developed a series of targeted communications so employees could focus on what’s most important to them. To promote open enrollment and clearly drive decisions, we targeted messages for different segments of the workforce, such as field employees, salaried office staff, and highly compensated professionals. We leveraged a variety of media channels, including the benefits website, email, and promotions such as postcards and enrollment kits mailed to employee homes. This approach ensured the right messages reached the right employees at the right time. The results exceeded expectations by a landslide. Enrollment in the minimum coverage plans (for the lowest-paid employees) increased by 76%. Our goal was 30%. Enrollment in the high-deductible health plan (offered to salaried field employees and office staff) increased by 26%. Our goal was 10%. The number of uninsured employees decreased by more than 900. Net enrollment in BAYADA coverage increased by 1,200, most significantly among field employees. BAYADA earned a Glassdoor 2018 100 Best Places to Work award. We were very intentional about our goals and how we were going to engage with Benz so we could really measure the ROI. We specifically focused on increasing enrollment in our Minimum Coverage Plan by 30%, and we increased enrollment by 76%. We were thrilled with that, and it was an easy way to measure the return on investment.